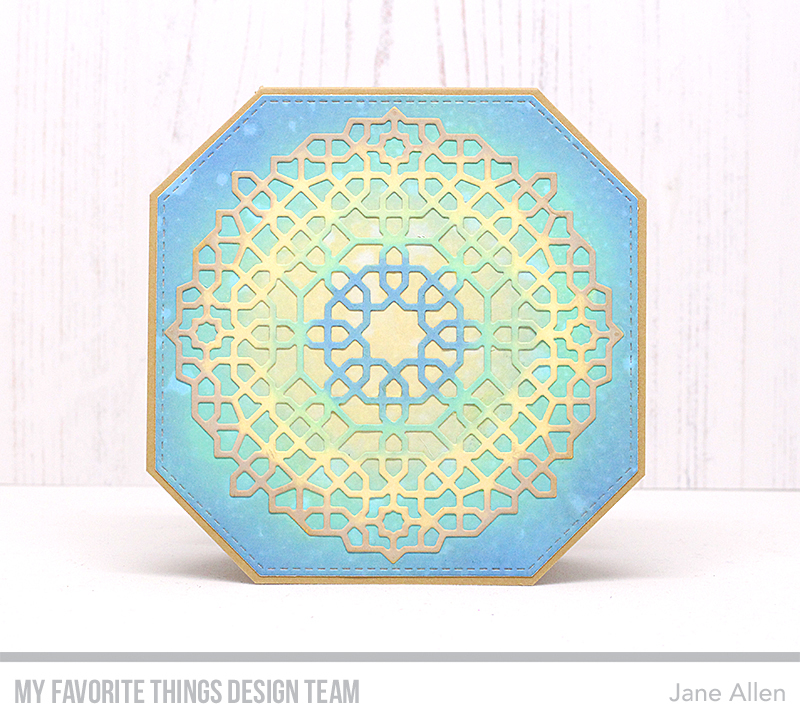 This card was created using the beautiful Moroccan Mosaic die and Distress Oxide ink. The card base was created using Latte cardstock, with the background mount cut from Bristol Paper using the largest Stitched Tag Corner Square Stax. I then used Faded Jeans, Cracked Pistachio and Antique Linen Distress Oxides to create a blended background, spritzing it with a Distress Sprayer. The Moroccan Mosaic die was inked with the same Distress Oxides but in reverse order with the addition of Frayed Burlap on the outer edge to coordinate with the Latte card base. This is in addition to the normal Free With $60 Die-namics gift. And of course please don't forget to leave a comment here on my blog for your chance to win one of two $100 mftstamps store vouchers! Thank you for dropping by and have fun shopping. I love the colors on this beautiful card. The colors are beautiful. What a great way to add color to a die cut. Wow Jane! I love the colors and the hexagonal card! I always think of your cards as drawing and eyes, so this is really a unique surprise and lovely. This is simply gorgeous and love the shaped card base! Nice! I like the combo of soft colors. The colors just seemed to shine - and I loved the shape. I want to try the spritzing! 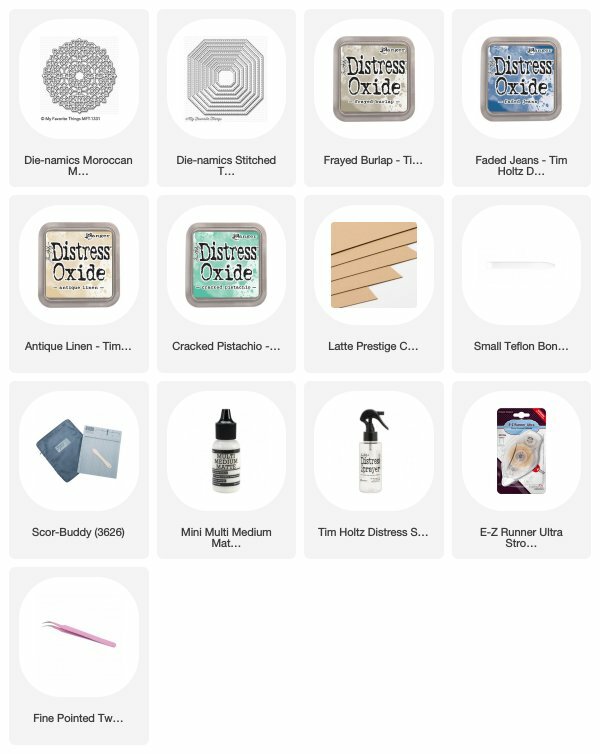 I love this month's MFT release with so many good options for cards. The mandala card on the hexagon base is especially pleasing and different. Great release and great inspiration. Great idea to reverse the colors on the die! Oh, what a lovely card! Such beautiful soft colors. Love the fun shape. Gorgeous card! And so simple - love it! Very elegant! Love those soft colors. What a lovely card! Love the soft colors. Beautifully done! Such a beautiful card. Love your color choices. I love the Moroccan Mosaic Die-Namic. It makes for such a clean & elegant card. Pairing it with the Stitched Tag Corner Square is brilliant! Soft and sweet. That's a card I'd love to receive! Very pretty card. I love the shape. Beautiful card using the mosaic die! Beautiful! I love the colors and the cool shape of this card. Beautiful card! I love the soft colors. Such a pretty card! Love the simple, yet stunning design! Beautiful card! Love the soft background you created for the die! I wasn't sure I wanted this die, but you have just changed my mind. This is gorgeous! I really like the splash of colour in this gorgeous card! I love your idea for a shaped card. You MFT designers are so ingenious. Thanks for making this a great release! The colors on the medallion are so soft and pretty and I also like the blue background. This is really effective Jane, but I miss your colouring!!! I love how you used colors on your card! Such a wonderful idea!!! This is beautiful--love the colors and shape. Wow !! That’s an amazing card !! And I love your choice of colours. Great color combo and the die but is amazing. Love the colours and how simple the card is. Really makes it stand out. Just love this new release.. The aquarium tank is so unique and awesome. So many fabulous items in this release! Lovely card with this great technique. Love the colour palette. Pretty card, very creative, love the shape. Beautiful card! The moroccan die wasn't on my shopping list but it is now! Love the colors and shape to this card! 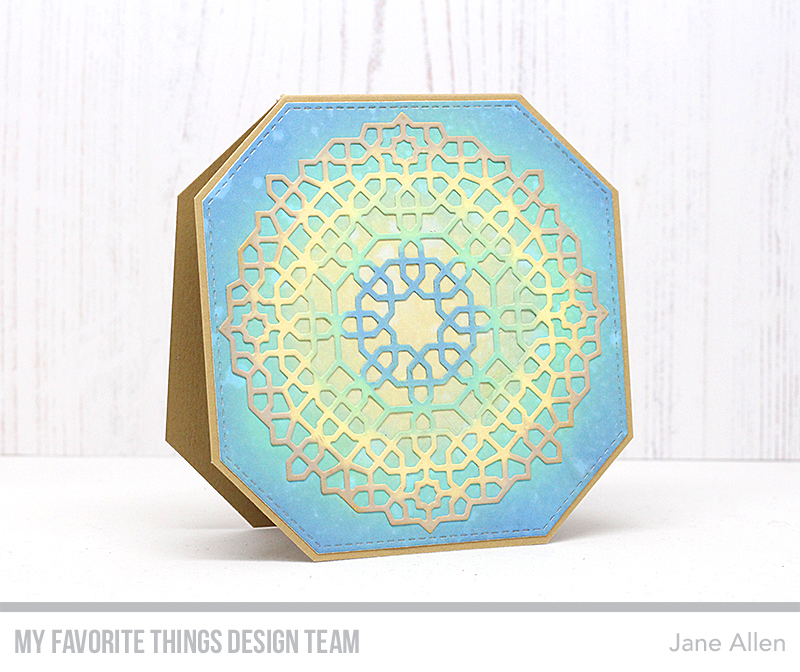 Gorgeous colors Jane, theyare perfect for the die! Thanks for sharing!